TM1 models very often use Excel spreadsheets for data input collection: Excel spreadsheets that we will be enrich by adding TM1 functions like the well-known DBRW and SUBNM functions. By using DBRW formulas, input by the user is sent automatically to cubes, nothing new here. Usually, input in the Excel sheets is done using Active forms and/or cube slices, thereby using among other tools TM1 picklists (data validation if you like). But it becomes interesting is we use Excel tables…, introduced in Excel 2007. If you do not know what an Excel table is, please read these 10 interesting tips about Tables. What can we do with tables when it comes to data input to TM1 cubes? Allow me to not just write and write long paragraphs of text, instead an example will be an eye-opener to you. The business case is as follows. You are the manager of a company called Great Outdoors (sounds familiar, no ? :-) ) and you are planning on opening new stores in a number of regions. This will increase revenues and profit, yet the initial opening costs will be substantial too. While being granted a budget of 100,000,000 $ you will need to come up a number of viable scenarios. You see the picklists for 'Retailer Type' and 'Size'. These 2 measures (and 2 other measures not shown) determine the 'Total opening costs' for that kind of store configuration. This information is captured in a different cube, following best practices for a cubes architecture setup. The user can then choose how many such stores he plans to open (in a chosen month - not shown here), which leads to the Total costs for all the new stores combined. That total should not exceed the given budget. You have just finished the setup. Congratulations! Now your input can start. Go to cell A2 and tab to cell B2. Choose a 'Retailer Type' and tab to cell C2 where you pick a 'Size'. Total opening costs per store will change if you also set the other 2 measures that I left out in the discussion of this article. Specifically, the measures 'Franchise/Corporate' and 'Asset Type' were omitted, and are needed to come to an Opening cost for a store. Tab to cell D2 and enter a non-zero value for the number of new stores to be built. 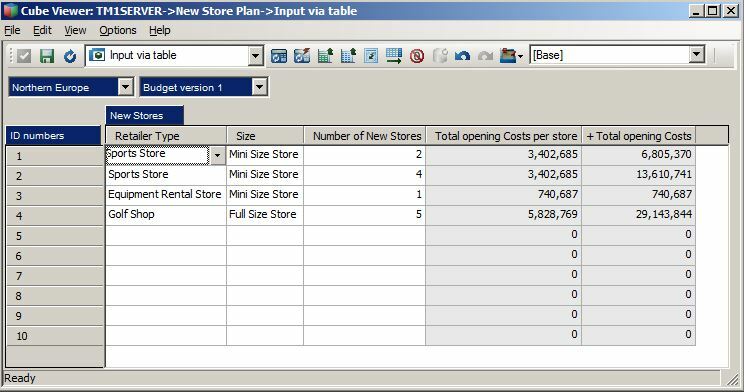 You will notice the total opening cost needed for your chosen number of stores (note that this calculation, a simple multiplication, is done in TM1 rather than Excel - we hold all logic in the model and not in Excel, unless it’s too heavy or cumbersome for the cube). Here is the upshot: if you tab to cell F2 and then tab again, a new line will be inserted! All formatting and all formulas will be filled down! Both Excel formulas (see column A) and TM1 formulas (DBRW) will be copied down. No need to refresh the sheet. No need for VBA coding at all. A Turbo Integrator process could transfer the values from this input cube to a different cube. It gets even more interesting when we will use Conditional formatting to indicate whether the budget was exhausted or not. I will keep this idea for one of the upcoming TM1 blog articles on my website. If a different title element is chosen, the DBRW formulas will reflect the new selection, but you might see too many 'rows': you can easily delete them or use VBA. Or, use an IF statement that checks the current row number against a (user-chosen) number of input lines. If more rows than necessary, bring the row number to "" instead of a valid row number. Lastly, let me just add that the TM1 Tools cannot handle these structured cell references. I showed you an interesting new approach to collect data from users, by 'line number'. I hope that this article can inspire you in a great deal.